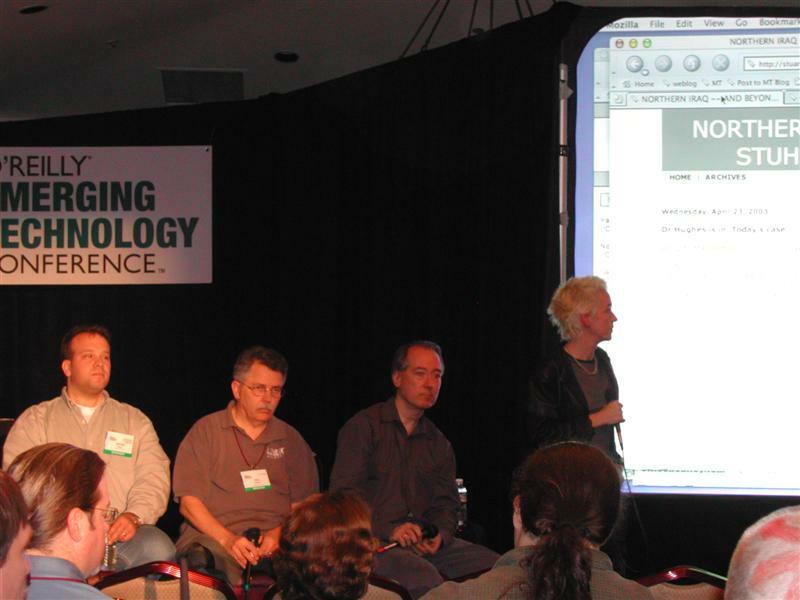 Stuart Hughes is on the line from England on a panel with (from left to right) Dave Sifry, Doc, Dan Gillmor moderated by Xeni Jardin. As I'm writing this Stuart just gave Blogger a shout out for helping out with his blog. Cool! Xeni is probing Stuart now on why he blogs and how he decides what to write. Stuart has responded that he started the site for a group of friends and that since the loss of his leg to a land mine in Iraq his purpose is still the same. Even with a much larger audience he still feels like he is writing his blog with his small group of friends in mind. (Just like shellen.com!). Dave Sifry is talking about the group of warbloggers that was/is active during the Iraqi war. Doc is talking about why he doesn't talk politics on his blog anymore (too much creepy email post 9/11 after expressing his pacifist views). Mentions that the 'peace/left blog' movement took a while to get up and running but is now a presence. Dave Sifry is talking about his site Technorati. Dave calls bloggers 'human collaborative filters for news'. Demos some of the breaking news features on Technorati. Doc is talking about Google News, saying that Technorati is complementary since Google News doesn't include blogs. Blogs point to news articles and one can gauge the popularity of certain articles through Technorati in this way. Dan interjects to say, journalists don't often point to other journalists or sites, though they might be better off for it.